Over the last few years of treating a large amount of gymnastics patients, elbow injuries have consistently ranked in the top five most common issues athletes come in with. A few of them have been more traumatic, accident based problems (fell onto an outstretched arm, accidently peeled off bars, etc). 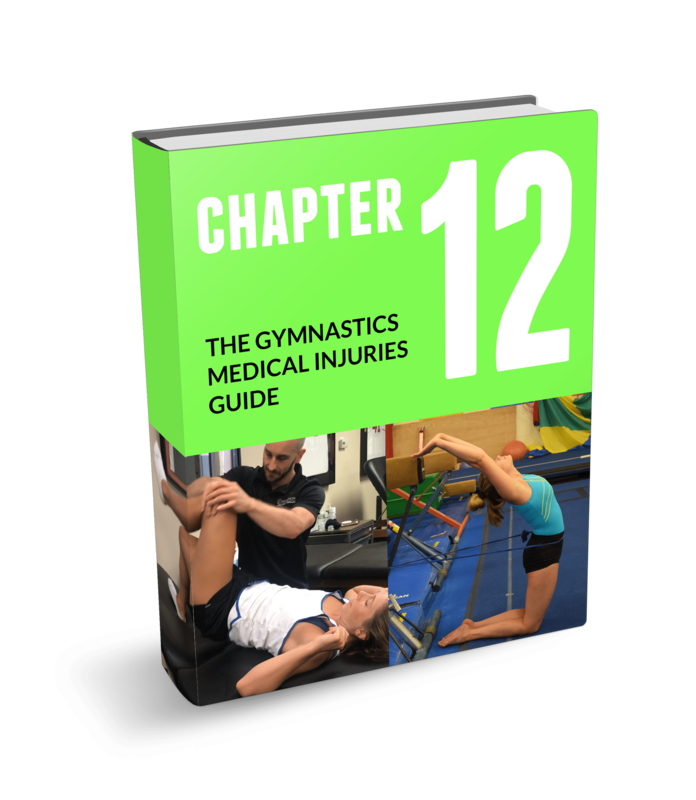 These injuries are usually elbow fractures, dislocations, or UCL tears which are unfortunately many times just part of the risk associated with gymnastics. What has been very interesting to me is that about 80% of all the elbow injuries I have treated were overuse based, falling into the “repetitive microtrauma” category. That term simply means that the elbow joint takes a bit more than it can handle, doesn’t fully recover between flare ups, and slowly starts to break down over time. These injuries are usually what’s known as Osteochondritis Dessicans (OCD), growth plate stress fractures, and triceps apophysitis. They tend to lead to huge problems from time away from training, to surgery, and some times gymnasts chosing to quit gymnastics. Given how tough some of these injuries can be for gymnasts, I have spent a ton of time reading research on these elbow issues in gymnastics. In digging through the science on this topic, I have found a lot of information on diagnosing/imaging of the injury site, as well as the main treatment options after the injury occurs (usually 3-6 months rest vs surgery). What I have not unfortunately found, are mechanisms specific to gymnastics on why we have such an insanely high rate of elbow injuries in gymnastics to begin with, or how to prevent them. I’ve talked with elbow surgeons as well as high-level coaches, and I think we have some ideas as a framework. However think we have to dig a little deeper into these issues by applying the latest research, as well as discuss how it links to some cultural components in our sport. We also need to translate the medical jargon into what we can practically do in during gymnastics training and the clinic to make a practical difference. 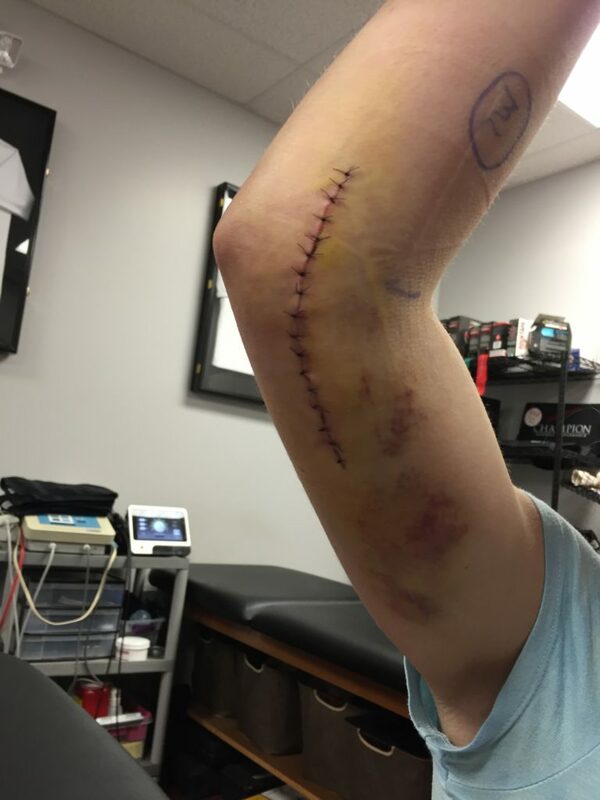 These injuries can be devastating, with treatments ranging from less severe injuries needing a mandatory 3-6 months of not using the elbow, to much more serious injuries needing surgery and a year off from training due to significant cartilage damage. Not to mention, the effects on a young gymnasts quality of life after gymnastics are potentially even larger. I won’t dive too much into the really nerdy biomechanical/medical concepts, but I will include links to research papers below for those interested. If you aren’t into the nerdy stuff, just skip this section. This one may seem really blunt and obvious, but I think it’s really overlooked in gymnastics. We have to remember that our arms do not have 1/10th of the mileage our legs have over thousands of years of evolution. Inherently our wrists, elbows, and shoulders are not made to bear weight like gymnastics requires. As a result, they do not have the same weight bearing structures that our legs do (thicker bones, cartilage, shock absorbing surfaces). Obviously, we can not do much about this, but it is important to know. 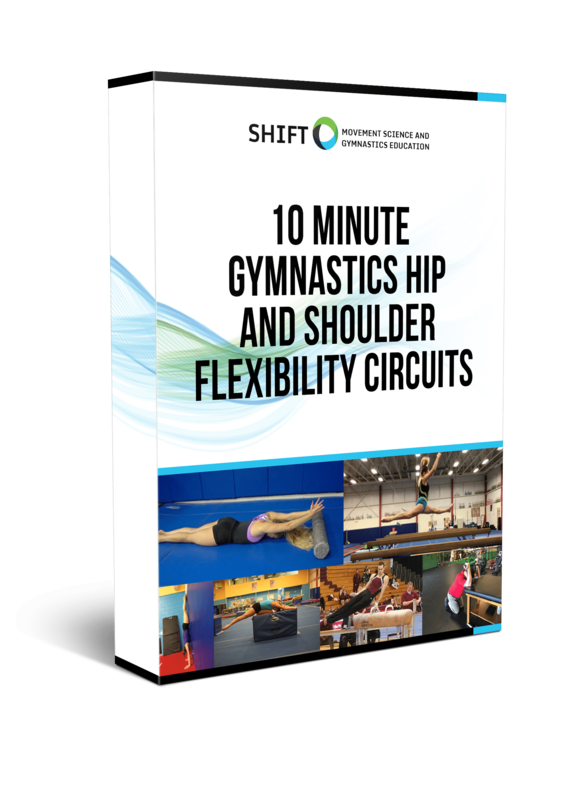 This idea requires gymnastics coaches and medical providers to be meticulous in making sure a gymnast is properly prepared for high force skills seen in the upper levels of gymnastics. This relates to physical preparation, technical preparation, and keeping a close eye on training volume over many years in a “long term athletic development” mindset. Which leads to number 2. There has been some fantastic research surfacing on training load and overuse injury risk in sports (find more research here, here, here, and here). Definitely carve time out to read through it all, but in short what a lot of it suggests is that sudden increases in training volume over a short amount of time can really put someone at risk for injury and decreased performance. Tim Gabbett’s work discusses how both too little preparation (not physically / technically for skill as mentioned above) as well as too much workload can be an issue. This makes sense when you step back and consider gymnastics. We all intuitively know gymnasts need to do a lot of strength, basic shaping, and drills to handle certain skills. This is the “too little preparation” side. But we also have to consider the opposite. I would guess ninety percent of the skills in gymnastics place on the elbow in some fashion through either compressive or traction forces. As a coach, I totally understand the well-intentioned desire of coaches to want to do a lot of skills/drills to help gymnasts reach their potential. That being said, as a medical provider who sees the serious elbow issues that come up, we have to be really careful about finding the optimal dose. Too little, and we know that the body will never adapt to handle it. Too much in a short amount of time, and then we have someone’s elbow getting really cranky. Having set numbers of vaults or beam series for gymnasts to not exceed will help track volume better. Rotating event focuses to not do all elbow impact is also a useful strategy. This combined with more formal strength programs (more in Part 2) and flexibility training can be huge. Hopefully down the road we will get better objective research on these concepts to apply in training. This is a newer concept that applies more generally to gymnastics, and not just to elbow injuries. Gymnastics has changed significantly in the last 10 years. Now more than ever, gymnasts are doing much harder skills, at a younger age, at a higher volume throughout the year. The desire to achieve very high levels at a young age, combined with the issue of colleges recruiting at a very young age (a separate discussion for another time) have created quite the perfect storm for overuse injuries to stack up. It’s also a perfect storm for overtraining, burnout, and many talented young gymnasts who unfortunately quit the sport early. It is now very common see very young, talented male and female gymnasts tearing through lower compulsory levels to be training level 9, 10, and elite at 12-14 years old. Although it’s an important topic related to the morality of subjecting such young gymnasts to that level of training, I want people to just consider the huge crossroads gymnasts face here. Again, this is absolutely not meant to spook people into stopping gymnastics. It’s to illustrate an important point. I have come to call this the “Gymnastics – Talent Crossroads”, where gymnasts are commonly jumping in level during their most at-risk years. I also openly admit I have not coached a nationally ranked or elite level gymnast. That being said I am fortunate to consult with coaches who do, and have treated quite a few high level gymnasts, and the principle still remains true. Not monitoring and managing a young gymnast properly can quite quickly lead to the overuse elbow, knee, ankle, and spine issues that plague gymnastics. On the other hand, if we approach this time frame carefully, we may be able to guide a gymnast through their most risk years and in turn get multiple years in return down the road. I have a ton of more information coming in the next parts of this article series, but if you are interested in learning more about gymnastics specific strength and injury prevention, be sure to check out my new free online PDF guide for Gymnastics Pre-Hab. At the risk of not making this too long, I am going to hold it there for this week. In Part 2 and Part 3 I will touch more specifically on shoulder/wrist flexibility, hyper extended elbows, skill technique, and strength training. I know the concepts above seem a bit more general and hard to make fast changes, but I feel they are the larger umbrella issues gymnastics is faced with. For now, I hope this was helpful. Best of luck! Reading all your articles and just want to say thank you for sharing your knowledge. Very informative and useful. Great article! My 13 year old has OCD in both elbows and we just don’t hear enough about the elbows. It seems to be all more about the knees. I wish there was more information out there about it. She has a stable lesion in one elbow and it has healed but has had 2 surgeries in the other elbow, arthroscopic and then just recently had the graft done as the first surgery really didn’t work as she was in chronic pain. She is a gymnast. We now have concerns about her becoming arthritic later in her teens and balancing the sport and the risks based on her OCD condition. tough situation all around. My grand-daughter has Panner’s Disease which is the juvenile version of Osteochondritis. She was just turned 7 when diagnosed with it and was out of full training for 17 – 18 months. She is now back to full training after having done minimal training over the 17 – 18 months and will turn 10 at the end of the year. She is in an elite squad. Luckily she managed to get all of her skills back very quickly and has gone ahead and doing more skills. We are hoping that this disease does not reoccur as my grand-daughter would be devastated. I look forward to reading the rest of your articles. No problem, happy to help and thanks for reading!